En español | Most of us don't think twice about taking a nonprescription pain reliever to ease a headache or soreness that might follow a game of tennis, but there is growing evidence that commonly used painkillers such as Advil can trigger heart attacks or strokes in some people. These nonsteroidal anti-inflammatory drugs (NSAIDs), a diverse group that also includes Motrin and prescription varieties like Celebrex and Voltaren, have been used for decades. * In the recent Danish study, naproxen (Aleve) was found to be safer than the others. Now there is strong evidence that many of them raise risks of heart problems, says Elliott Antman, M.D., a cardiologist and professor at Harvard Medical School. Several new studies underscore a growing awareness of the problem. In Denmark, a team led by Anne-Marie Schjerning Olsen, M.D., a research cardiologist at Copenhagen University Hospital, reviewed medical records for nearly 84,000 heart attack survivors, 42 percent of whom reported using NSAIDs. According to a paper published last May in Circulation, the journal of the American Heart Association, the team found more cases of second heart attacks and strokes among the NSAID users — except for those taking naproxen (Aleve) after as little as a week. Researchers reported last year that NSAIDs raised the general risk for heart attacks even in apparently healthy people. The painkillers have also been linked with stomach bleeding and kidney failure. Although many doctors endorse the short-term use of the common painkillers when there are no other pain-relief alternatives, the study authors decided there is no safe amount of time to take NSAIDs, according to Olsen. In July, American and other Danish researchers reported in the British Medical Journal that new NSAID users faced an increased risk of a dangerous heart rhythm called atrial fibrillation. The risk was higher among older patients, those using celecoxib (Celebrex) and people with chronic kidney problems. 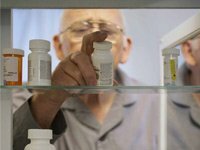 At the University of Florida College of Medicine, doctors who studied the records of older patients enrolled in a trial of competing blood pressure drugs found that longtime regular NSAID users faced a nearly 50 percent higher chance of death, heart attack or stroke. The findings, published in July in the American Journal of Medicine, suggest that doctors should weigh the dangers of these medications carefully, says Anthony Bavry, M.D., the cardiologist who led the study. He recommends acetaminophen (such as Tylenol) to his patients, because it may have a much lower risk of heart complications than other NSAIDs. "Many patients change after they understand the risk from these agents," he says. "Just because something is available over the counter doesn't mean its use is free of any risk." These studies mainly looked at older patients with signs of heart disease, but the risk extends to older people generally, says Antman, who is also an editor at Circulation. Still, this very real risk isn't registering with many patients. "Just because something is available over the counter doesn't mean its use is free of any risk," he says. People often start taking these medications seeking pain relief for a temporary problem. "The patient feels better and they make the assumption that they need to continue taking this medication," Antman said. "It's a very important cycle to interrupt." Doctors who cannot find another way to control their patients' pain symptoms should proceed with caution, said Antman, who made that point in a 2007 Circulation scientific statement. "The key message is take the NSAID that is associated with the lowest risk, in the smallest dose for the shortest time necessary to relieve the pain." Michael Haederle is a freelance writer whose work has appeared in People, the New York Times and the Los Angeles Times.